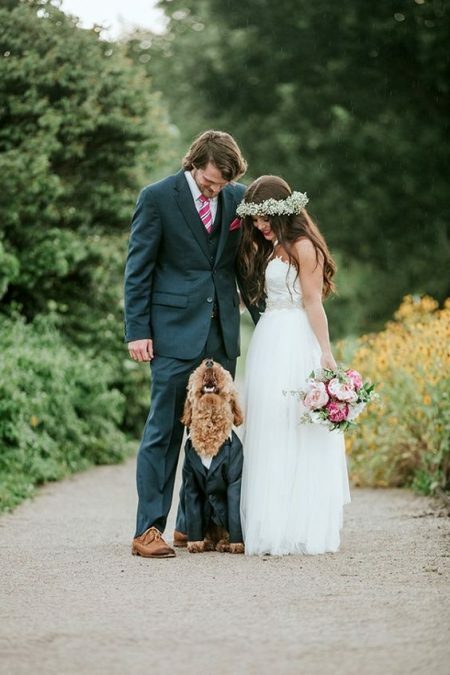 How to Include Pets in your Wedding: Best Tips and Ideas Ever! 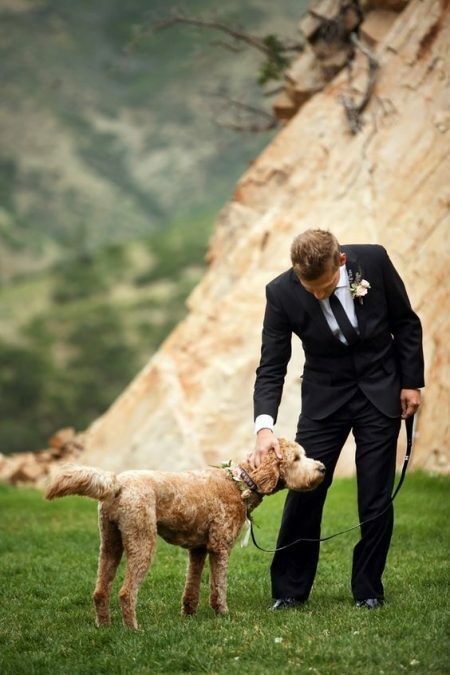 Do you know how to include pets in your wedding? We bring you a ton of fabulous advice and the cutest and most original ideas to have pets in weddings. The maid of honor holding the bride’s bouquet. Photo: kdrouetphotography UK. Paws down, having pets in your wedding will make for a memorable experience. A new cool trend exploding in popularity among animal lovers. 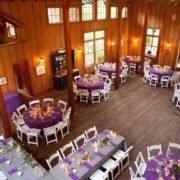 With your furry or feathery friend by your side as you tie the knot, your special day will carry that cuteness in a unique and fun way. Of course, our pets being family and a huge part of our day-to-day life, it’s only natural to include them in your big day festivities. Check out these ideas and tips on how to include pets in your wedding. 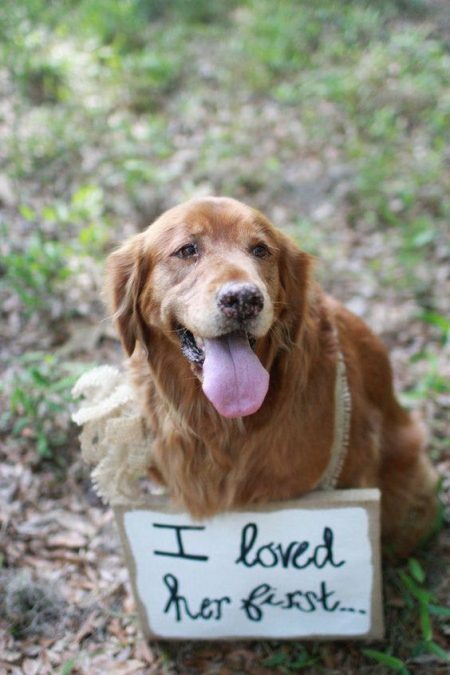 If you are having pets in your wedding, there are a few things you must consider. 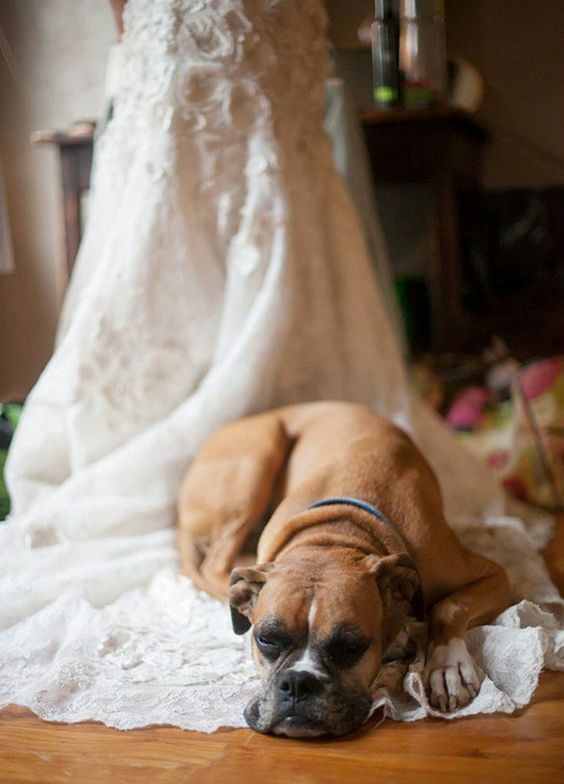 First, what do you envision your pet doing at your wedding? 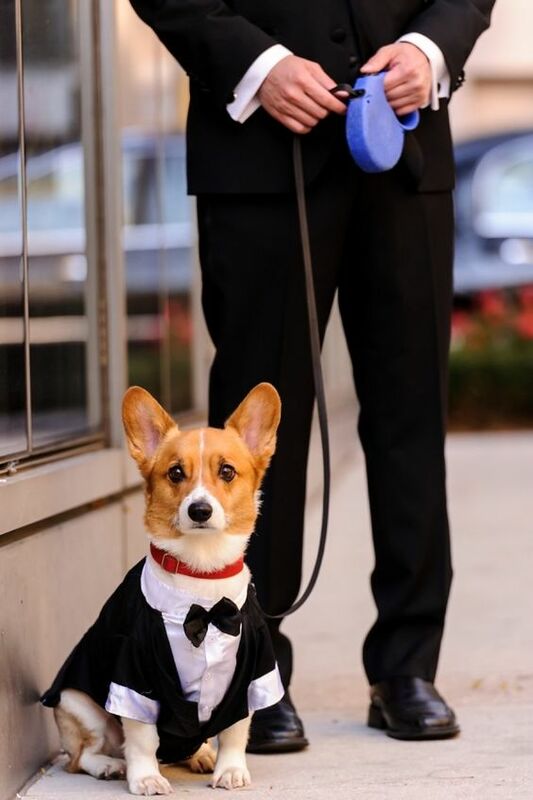 Are you going full doggo with your wedding plans, or you just need Buddy to look sharp in a tuxedo? 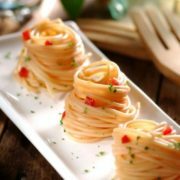 An integral part or just a bystander? 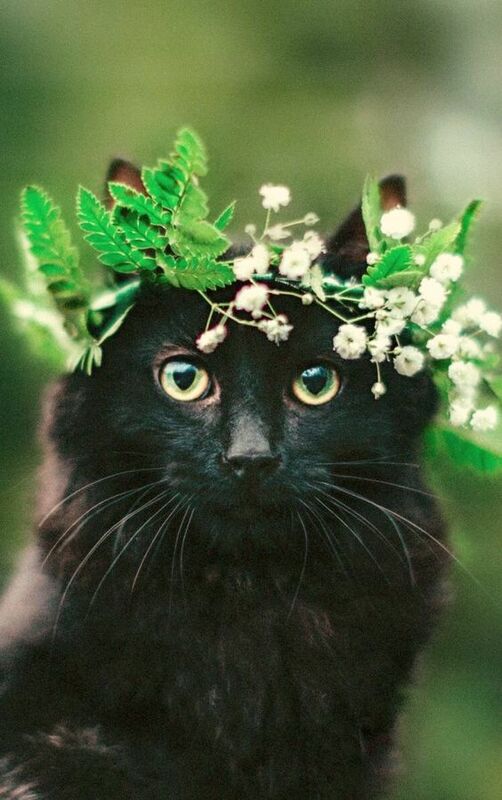 Will your cat pose for a styled photoshoot or will you have your beloved horse wear a flower crown? 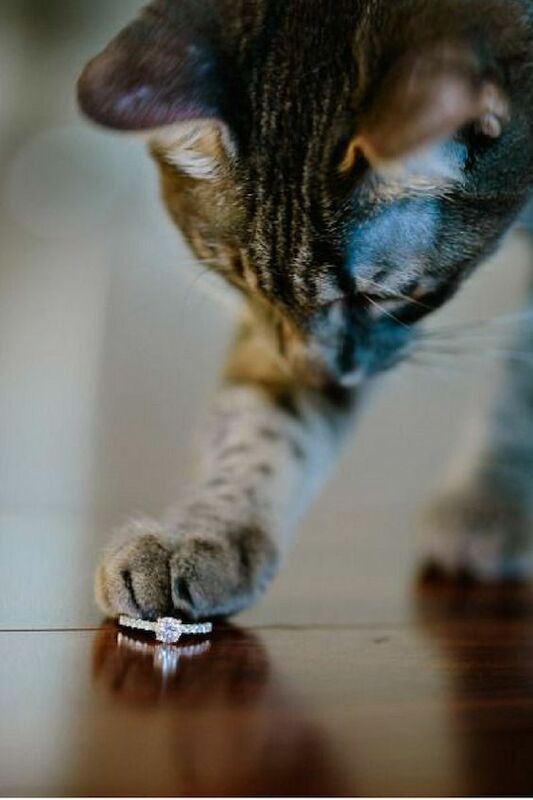 Of course, if your wedding venue does not allow pets, Bella may have to miss out on being the ring bearer. You want your pal to look her best. Because all dogs are beautiful right? 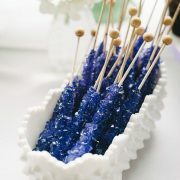 But if you combine them with a fresh ‘do and some pretty florals or bows, you’ve reached a whole new level of cuteness! Beautifully groomed, this Bichon Frise is ready to walk down the aisle with the flower girls. 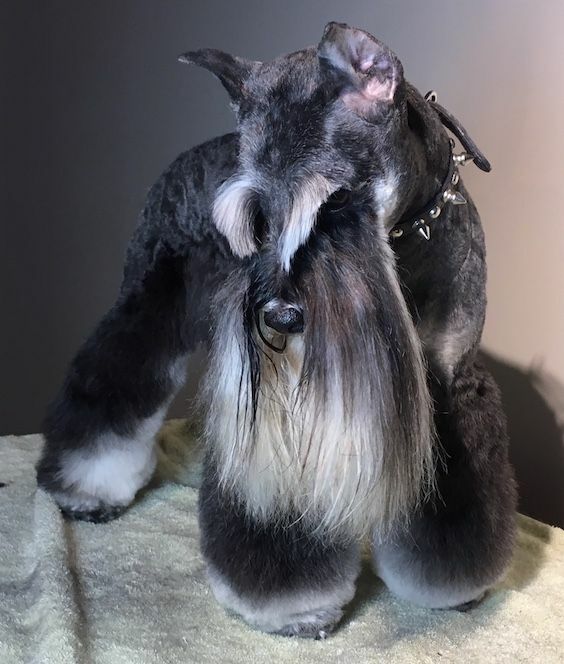 Professional groomer Julie Cohen of Atlanta, recommends at least one grooming session before the wedding and another one the day of. Some breeds, like Schnauzers, Bichon Frise or Poodles should get started on a grooming schedule at least six weeks before the wedding. Julie Cohen, groomer extraordinaire, gives us amazing advice to have our furry pals looking their best at weddings. Atlanta. It would help you in deciding the role you’d would want them to play come the big day. Can your pet endure hordes of strangers and loud music? Does Missy like being around people, or does she growl or hiss at strangers? Does Charlie get restless after a while of being petted? If your pet is the latter, set aside a specific area for your dog—visible but not touchable by loving, petting guests. 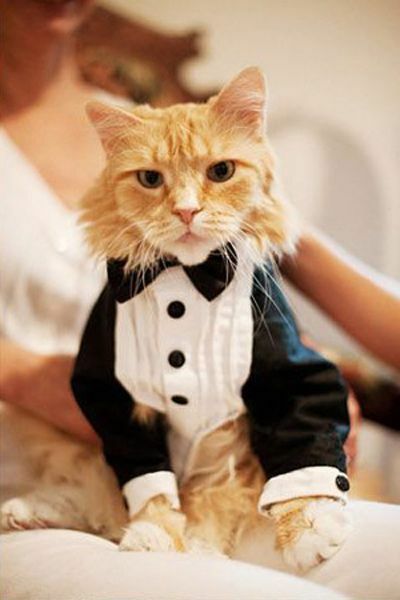 You may also restrict your pet’s appearance to a specific moment or to a casual or styled photoshoot. This Yorkie is loving the attention! Photo: Ava Moore Photography. He’s family after all, so why not have the first dance? Photo: your perfect wedding photographer UK. Or someone the pet is comfortable with. You can’t always say with pets; a stray squirrel or mouse may have them dashing off for the exits. 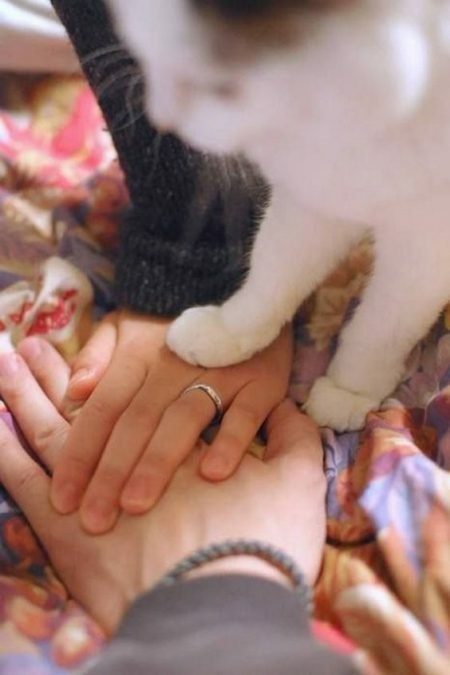 Having a stand-by pet whisperer will help keep things under control while you are busy saying your vows. The petsitter will also be in charge of feeding and walking your pet besides making sure she doesn’t dive into any chocolate! Pet mishaps. Make sure they are well watched, a pet-sitter will come in handy. 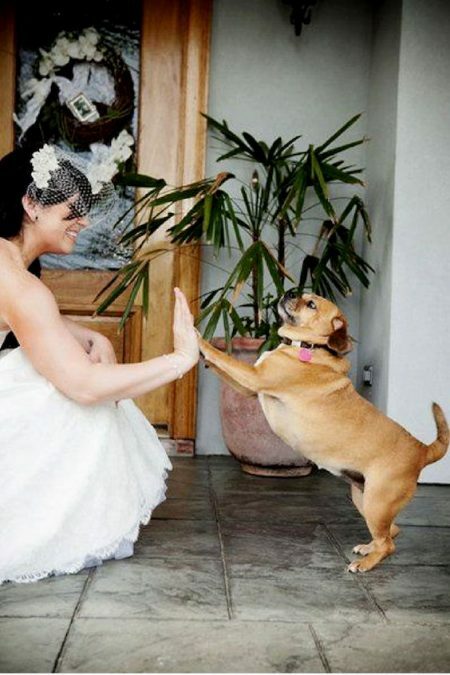 Give folks a heads up about the presence of pets in your wedding. Allergies are a troubling thing, so precautions must be taken. You wouldn’t want allergic guests feeling miserable or looking all sniffly on the photos! A distinctive way to incorporate pets in your wedding, a cute flower crown that matches her eyes! Let your wedding photographer know. He may bring along a pet photographer to capture your pet in action! 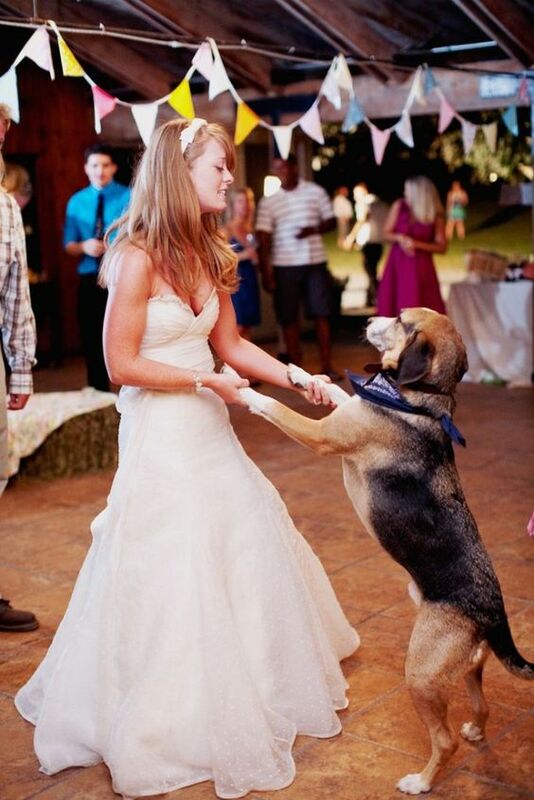 well trained furry friends will steal the show at your wedding ceremony. Identify potential outfit hazards before the nuptials. 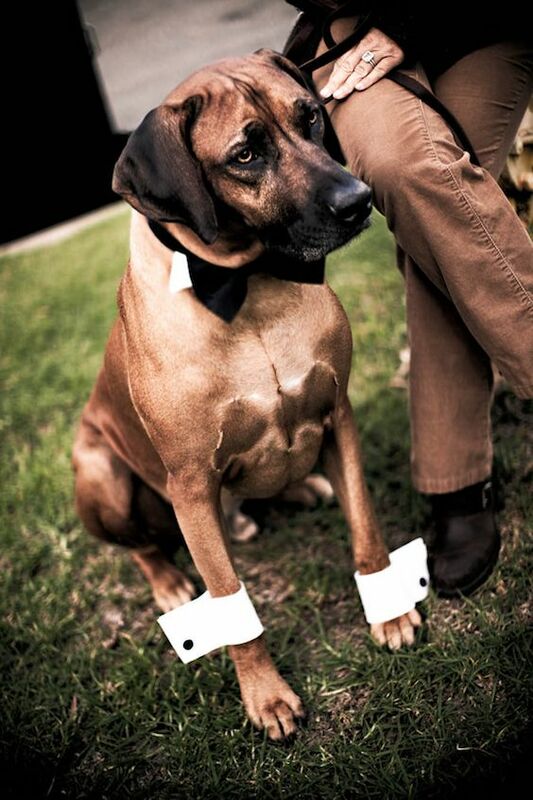 Groom and prepare your dog for that big day. Don’t let him run around the yard. You wouldn’t want a muddy mutt bearing the ring! Have them cleaned and, if you’ve so chosen, properly dressed for the occasion. 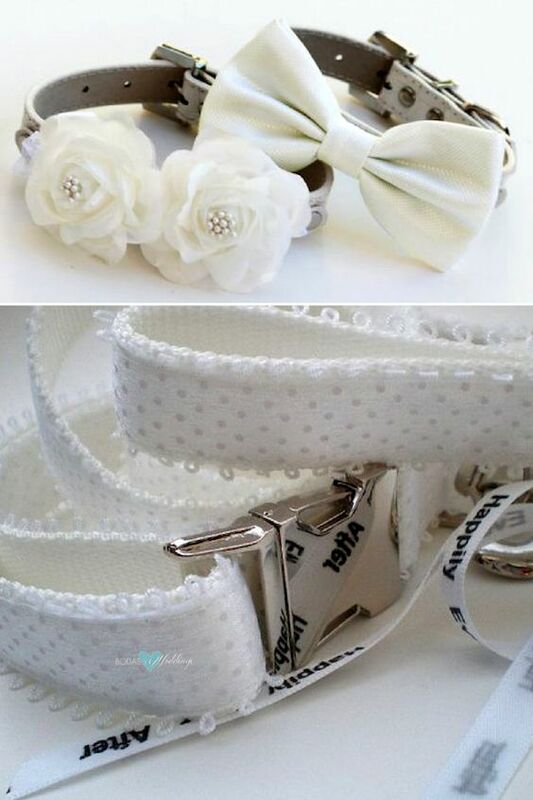 White collars with flowers and bows and matching leash for your best pups. 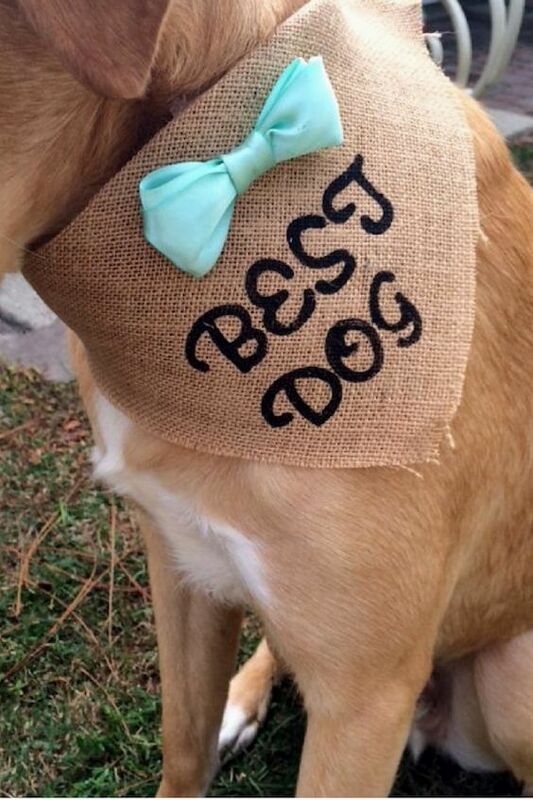 Via LA Dog Store and Collar Habit on Etsy. Can’t imagine your big day without your best friend? Let’s face it – incorporating your dog in your wedding will make the happiest day of your life even happier. 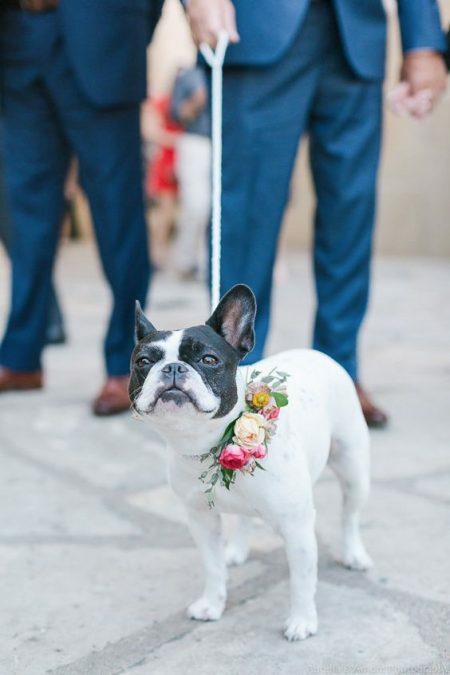 So here are a few adorable ways to include pets in your wedding. A pair of cuffs and he is ready for the occasion! Magnific casual shot by Jihan Abdalla Photography, Los Angeles. 1If you are going to dress and accessorize your pets, let it be comfortable and harm-free for the pet. 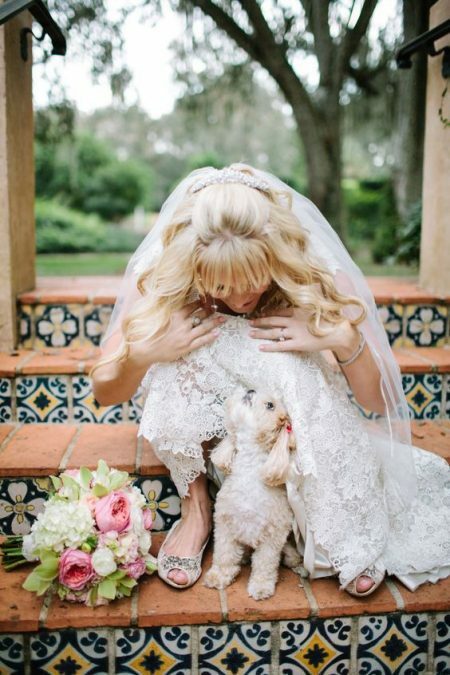 Choose a color that doesn’t just contrast against the fur color – white on a Bichon would get lost – but also matches the wedding theme. If your pet would shake off that beautiful hat or remove the bandana, fur painting could be an original option. 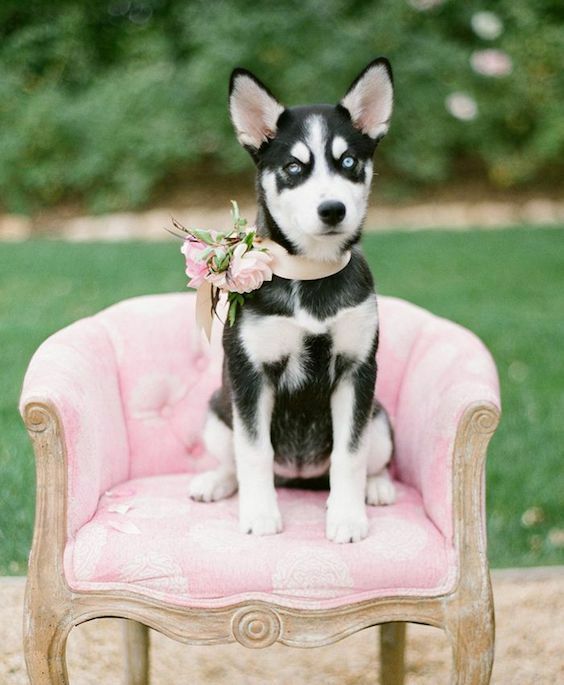 Adorable ways to include pets in your wedding. 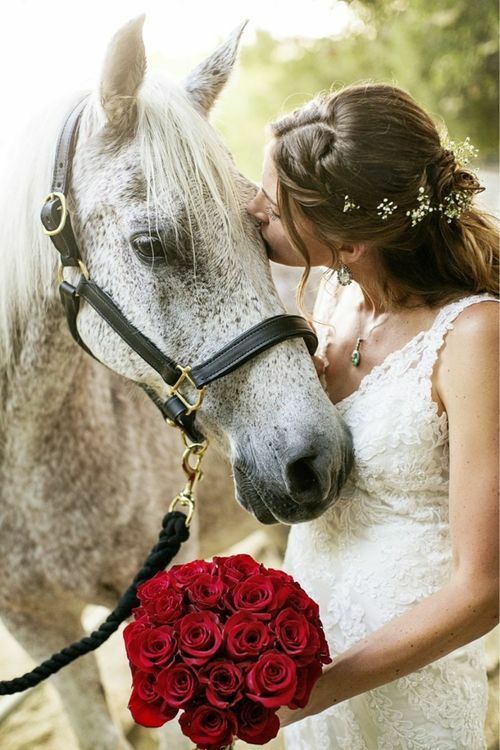 Pick from a styled photoshoot, riding your horse or a sweet flower crown. 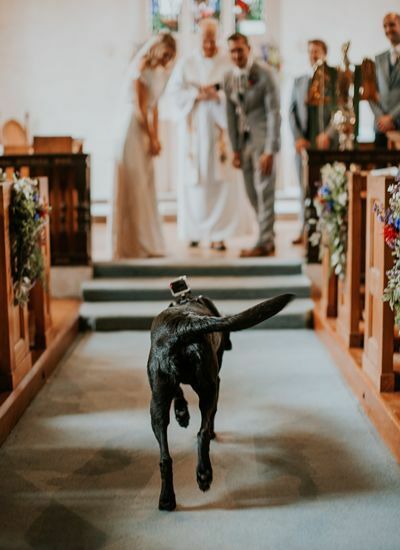 2It might sound cliché, but nothing draws more gasps of admiration from guests like a trained dog walking down the aisle as the ring bearer or flower girl. With nail polish on your quadruple’s pedicure, to tiaras on her head, your pet will look outstanding as it paws through your special day. If your dog is properly trained, feel free to have her pose on a special chair. Amiright? Cutest pets in weddings. 3Let’s not forget the possible delights of silky veils, bowties, lace, and taffeta! Moreover, if your pet isn’t the “flower carrying” type, get collars of floral blossoms and greenery to serve the same purpose. More and more pet owners are finding adorable ways to include pets at weddings. Photo: wedding-retoucing. 4If you know your best friend would prefer to stay at home, have him accompany you by having your pet’s photo on napkins, portraits, or even table number cards. 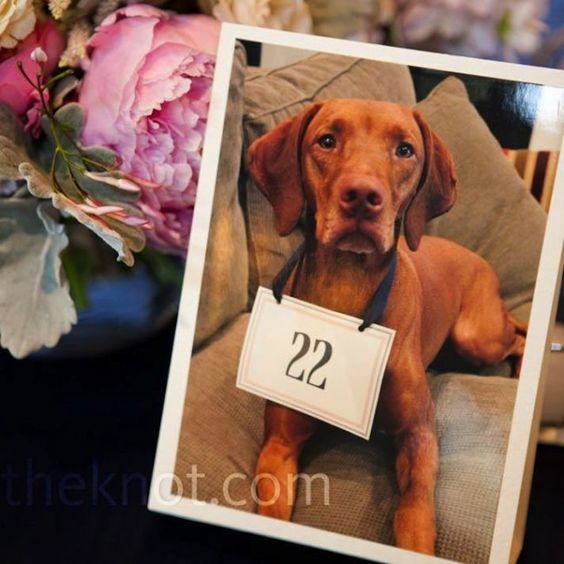 Another way to incorporate your pet in your wedding table numbers. 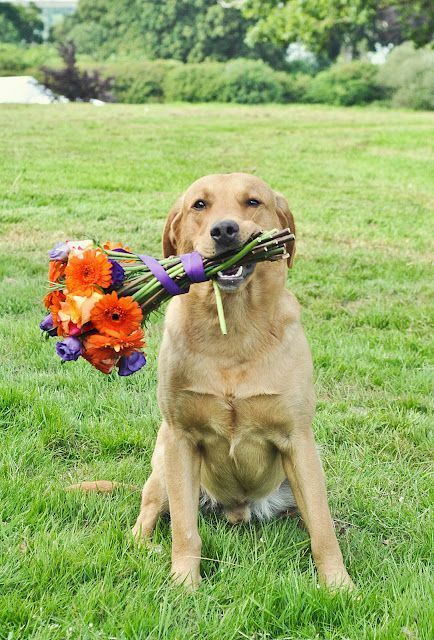 5A canine theme may require that you delight guests with doggie-themed wedding favors. 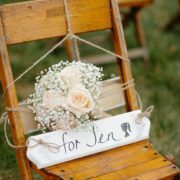 From creative party favors to pet-themed decor, having pets in your wedding is an awesome way of cementing your affection for your furry or feathery companions. 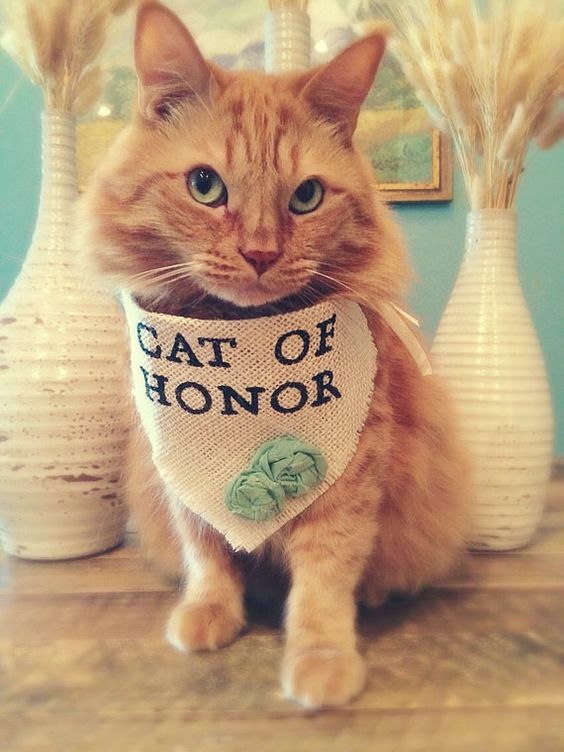 Bandana “Cat of Honor” wedding collar via Etsy. 6Do a snazzy photo shoot with your pets, and engrave the occasion forever with creatively styled pictures. Prepare your photographer to capture the best moments with both planned and freestyle shots with framily and pets. Best dog at wedding! 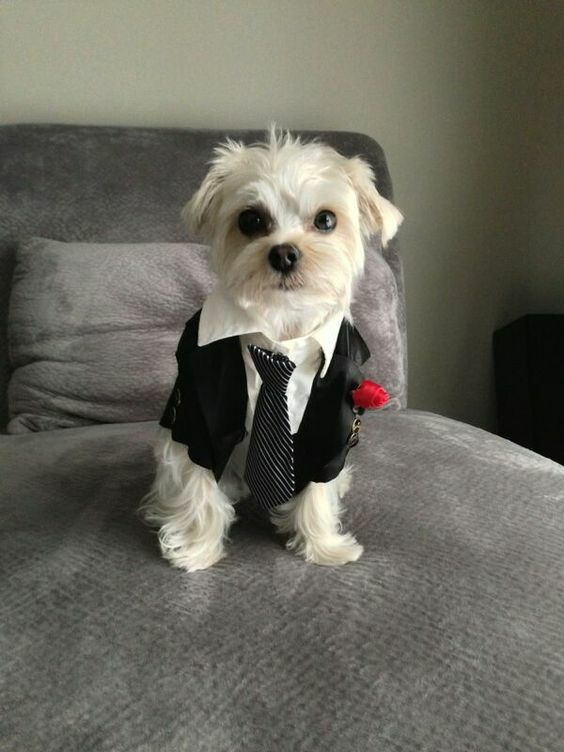 Ultra snazzy pup-tux. 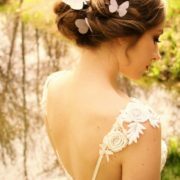 Photography: Wedding Retouching. 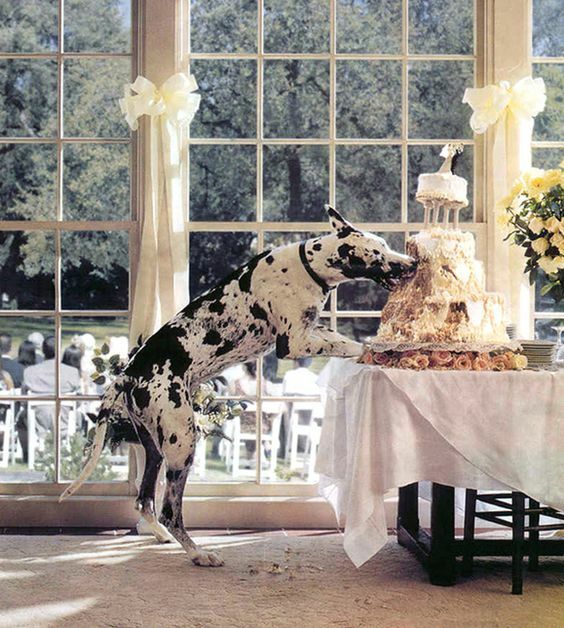 7The outdoors are perfect when having pets in your wedding reception — as they can run and romp in the surroundings. Remember that the best moments are usually unplanned. Those eyes and that face! 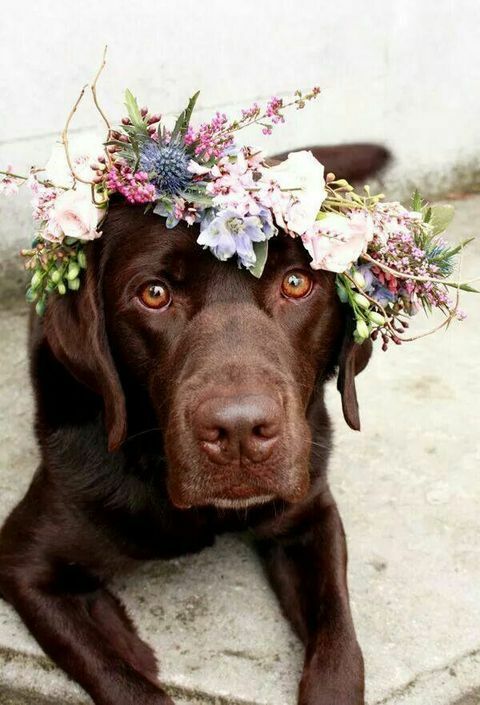 If your dog can keep a flower crown on, try this out! 8Other more uncommon pets, like bunnies, tea-cup pigs and horses can be made part of your celebration too! 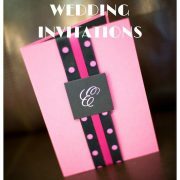 Add them to your save-the-date photo or spiff them up with wreaths, crowns and glorious bows. 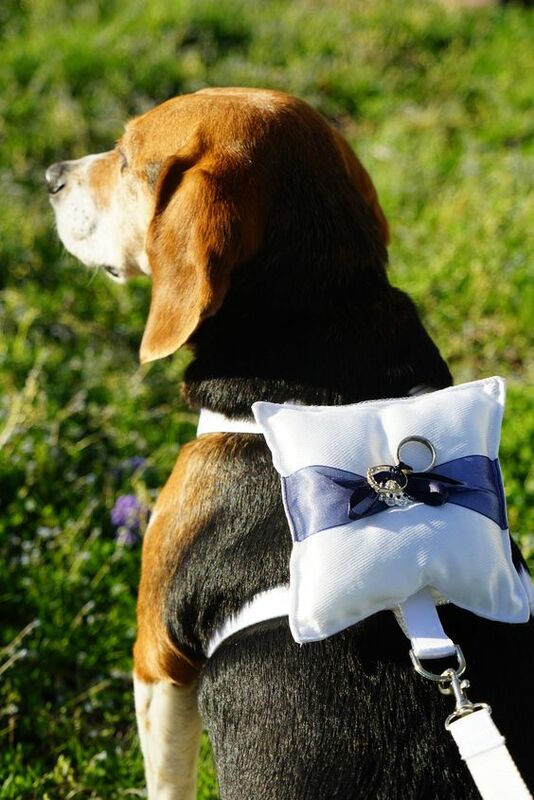 Ring bearer dog harness with pillow and matching leash. Pick the accent ribbon color. Via Etsy $59.95. 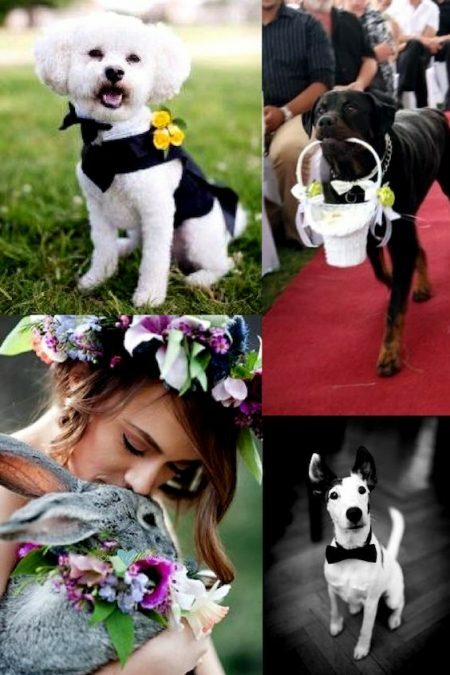 More Ideas for Pets in Weddings: Check out this Gallery! 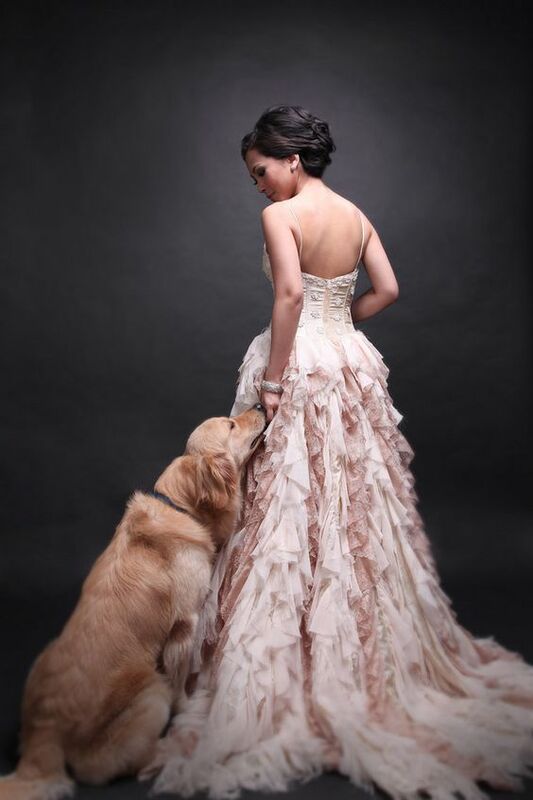 A photoshoot session with your pup will be something you will cherish forever. 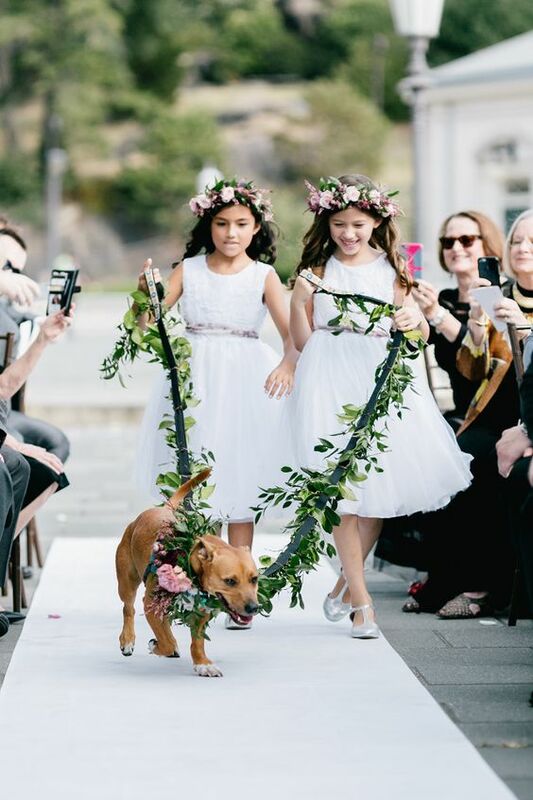 What can beat your puppy leading the flower girls at your wedding ceremony? Emily Wren Photography. Know the temperament of your pet. He may get tired soon and want to rest with mommy. 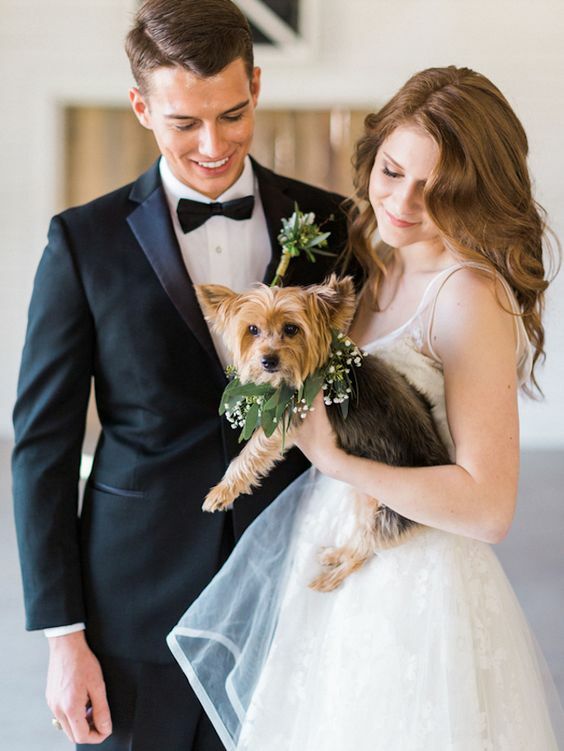 11/15/17 /4 Comments/by Havi G.
https://bodasyweddings.com/wp-content/uploads/2017/11/cutest-pets-in-weddings.jpg 685 564 Havi G. https://bodasyweddings.com/wp-content/uploads/2019/01/bodasyweddings-logo-byw.png Havi G.2017-11-15 21:13:542018-05-08 18:35:08How to Include Pets in your Wedding, Best Tips and Ideas Ever!